This is a unique event where authors come together with music artists, young writers rub shoulders with experts and genre legends put down their instruments and open up in front of an audience. For example, just announced is the exciting addition of Folk icon Eliza Carthy in conversation with the writer Ian Clayton on Saturday 10 November. Ever pondered the difference between poetry and lyrics? Wondered which songs make a writer pick up their pen? What does it take to put together a music biography? Louder Than Words is a festival for you. Curated by Dr Jill Adam and John Robb, 2018’s festival features a wide range of creative talent. Figures already announced include crime novelist Ian Rankin, Andy McCluskey of Orchestral Manouveres in the Dark, original punk icon Jordan and photographer Kevin Cummins. And those are just some from the heavyweight line-up. Taking place over the three days in the Grade II listed Principal Hotel on Oxford Street – built in 1895 as the Refuge Assurance Building – this is an atmospheric location for the array of talks and interviews on offer, giving the chance for guests to get close to key cultural figures. The festival opens on Friday 9 November with Gemma Cairney – a presenter known for her work on both BBC Radio 1 and 6 – followed by the current bass player with Pink Floyd, Guy Pratt. Guy is set to perform his one-man show ’The Inglorious BASSterd’, as well as giving accounts of his work with everyone from Michael Jackson to Madonna. Expect a bit of bass action too. Moving into Saturday, choices include Zoë Howe talking about her Stevie Nicks biography, as well as Lucy O’Brien – a journalist known for her work on women in music – chairing a panel about Madonna as a gay icon. Also on the bill for Saturday – Chris Difford talks about his life and time in Squeeze, punk icon Jordan looks back on her life in a discussion with Cathi Unsworth and Stuart Bailie is in conversation about his writing, with his most recent book Trouble Songs (published March 2018) looking at the story of music and conflict in Northern Ireland. A strong Manchester connection can be seen in the work of photographer Kevin Cummins, perhaps best-known for his music photography – with famous shots of Joy Division (with one in particular taken on Hulme’s Epping Walk Bridge, minutes away from the Principal Hotel), New Order, The Smiths and Morrissey. He will also be speaking on the Saturday. On Sunday, there are plenty more music icons in conversation – including Andy McCluskey overviewing his time with OMD and David Gedge from The Wedding Present discussing band life. 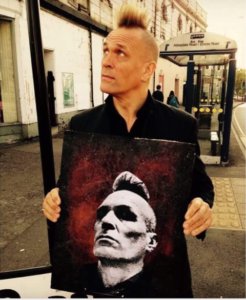 Sheila Rock will also discuss her photography with Rudi Esch (Die Krupps), and crime novelist Ian Rankin will complete a ‘desert island discs’ of sorts– tracking his life through ten albums. And it’s not just loud – it’s proud. As well as looking back with significant music personalities of past decades, Louder Than Words also celebrates future voices. 2018 sees a distinct emphasis on young journalism and writing, with the festival welcoming back the Slam Poetry workshop team, as well as involving students as volunteers and panellists. The Wilko Johnson Writing Award will also make a welcome return, celebrating young music writers under 25. There is certainly something for everyone – and it is set to get louder yet. A number of announcements are yet to be made. Rather than just a music festival, this is a unique celebration which offers so much more – an exploration of creative culture, writing and sound. 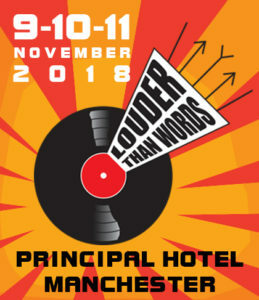 Tickets are available via http://louderthanwordsfest.com/tickets/ and are available as weekend passes, day passes, or event tickets, ranging from £6 for an event to £70.66 for a pass to the whole three-day weekend.